Rice is a tropical crop, but has been domesticated to grow in cold climates. Yet rice seedlings are still suffering from cold stress during early spring and late fall, or even in cold nights when the temperature drops below 12 degrees Celsius (or 54 degrees Fahrenheit), especially in the regions with high latitude. Improving management by incorporating modern weather forecast may help to relieve this issue. The other route that can fundamentally solve the issue is to improve the level of cold stress tolerance of the crop itself. 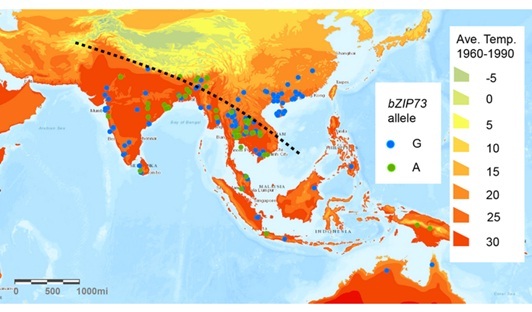 Chinese scientists recently identified a gene facilitated adaptation of rice to cold climates. Asian cultivated rice has two subspecies, indica and japonica. Indica rice is mainly grown in the tropical and subtropical areas including South China, Southeast Asia, and South Asia. It does not tolerate cold stress very well. Japonica rice is mainly grown in temperate zones including North China and Japan. Comparing to indica rice, japonica rice has improved levels of cold stress tolerance, which is most likely due to artificial selection and local adaptation during the domestication. By combining population genetics, evolutional biology, and molecular biology techniques, Prof. CHU Chengcai and colleagues from Institute of Genetics and Developmental Biology, the Chinese Academy of Sciences identified a critical regulatory gene bZIP73 that may have facilitated the northward expansion of japonica rice by improving its cold stress tolerance, as discussed in this week’s issue of the open access journal Nature Communications. This regulator, the japonica allele of bZIP73 (bZIP73Jap) functions through the interaction with bZIP71 by modulating abscisic acid level and reactive oxygen species homeostasis, which could significantly enhance rice tolerance to cold (Figure 1). Interestingly, the DNA sequence between the cold sensitive and cold tolerance bZIP73 gene only differ one base-pair, so-called single-nucleotide polymorphism (SNP). By tracing this SNP back to rice ancestors, the common wild rice, Prof. CHU and colleagues pinpointed the origin of cold tolerance from a group of rice ancestors, which carries the cold tolerance genotype and enable the further north expansion of rice cultivation during thousands of years of domestication (Figure 2). “Understanding the molecular basis of japonica rice adaptation to cold climate is crucial for further improving cold stress tolerance of the crop”, as said by Dr. LIU Citao, one of the first authors of this paper. The research was supported by the National Natural Science Foundation of China and the State Key Laboratory of Plant Genomics. Embargo: 10:00 London time (BST) / 17:00am Beijin time, 17 August.